When Americans think of mustard, they typically envision bright-yellow Ballpark mustard coating a hotdog. We tend to lose sight of just how many varieties of this wonderful condiment exist in the world. Unfortunately, we also limit ourselves to just yellow and the occasional honey-Dijon mustard. The truth is, however, there are hundreds of kinds of the condiment in the world. Some of the most common are honey, Dijon, spicy brown, coarse, whole grain, and horseradish among many others. 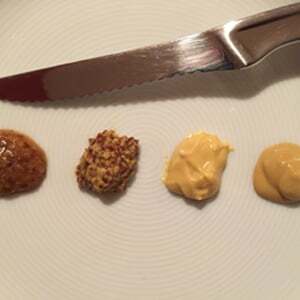 Germany has provided the world with a variety of great-tasting mustards (Senf). These varieties include süß, brown Bavarian, scharf and extra-scharf! This is a more complicated question than one would at first think. Senf is created from mustard seeds, which are in turn harvested from mustard plants, of which there are a wide variety. These plants have flowers that form beautiful fields where they are grown. The seeds are ground up into a powder that is then mixed with a liquid, typically water or vinegar. This mixing creates a chemical reaction in the mustard seed powder that releases the enzyme myrosinae, as well as various glucosinolates. This reaction is what creates the “heat level” of the mustard, or what many American refer to as the spiciness of it! Interestingly enough, there is a correlation between the color of the seed and its spiciness. The darker the seed is, the spicier it will be, and the lighter it is the milder it will taste! Mustard has been popular in Germany since the medieval ages. During this dark period in European history, Senf was used for medicinal purposes. However, it was also used to flavor much of the at-the-time bland food in the country due to a lack of available spices. Since then Mustard has come a long way. Today there are three different kinds of the condiment that one can buy in Germany. Senfkörner is the whole seed that can be used to season sauces or meat. Senfpulver is a dry powder that is often used in cooking as it is easily mixable with other ingredients. Finally, Senf is the most common form consumed in Germany. It is the paste that we most often call ‘mustard’ in the U.S. The two most famous German mustards are Düsseldorf and Bavarian Sweet. The main difference between these two varieties is that Bavarian Sweet keeps with its namesake, while Düsseldorf has more of a sweet-sour taste. Düsseldorf‘s brand is particularly famous due to its having the first Senf factory in Germany in 1726. Particular to Düsseldorf mustard is the dish that it is served in, called a Mostertpöttche. This beloved mustard jar was even immortalized by Vincent Van Gogh in a well-known painting. Bavarian Sweet is attributed to Johann Conrad Develey in the 19th century in Munich. He created the now-famous concoction by adding vinegar, spices and sugar to yellow and brown Senf and boiling it by sticking hot pokers in the mixture. In 1854 he added brown sugar to the mix instead of white, enhancing the sweetness and creating the brown color that Senf lovers have come to cherish. Germany’s main types of Senf are spicy-hot, mild, and sweet brown. Each of these three varieties is to be enjoyed in a certain way. Spicy-hot types are to be used as garnishes for meats. These are to be eaten with a meat and cheese tray, sausages, or smoked meats. The mild kinds commonly accompany dishes with fish or on top of crackers or a pâté. Sweet brown is served on top of Wurst (sausage) in rolls, and it pairs deliciously with a Bavarian Weisswürst (white sausage) and a Weizenbier (wheat beer)! The beauty of Senf is that it complements the flavor of anything without masking it. It adds dimension and depth to the flavor of any dish, which is why it is one of the most beloved condiments in Germany, as well as the world as a whole!